A few months ago Cameroonian social entrepreneur Alain Nteff rushed from a taxi in Yaoundé to find a quiet place to take a call from a UK number. And 15 minutes later he felt the telephone interview went well, but decided not to tell his mother and family about it yet – he didn’t want to raise their hopes in case nothing came of it. Alain Nteff meets Queen Elizabeth II and is awarded the first ever Queen’s Young Leader Award at Buckingham Palace. But a couple of weeks later, he received an email: he was going to be flown to Buckingham Palace to meet Queen Elizabeth II and be presented with the first ever Queen’s Young Leader Award. “I was so excited. I just forwarded my mail to my co-founder and left the office. And there was this moment,” he recalled. Nteff was up for the award because of his work at GiftedMom, an e-content platform for pregnant women and newborn mothers that provides vital information via mobile phones to combat the high number of mother and infancy deaths in under-serviced communities. “Where we are from it’s not every day that we win prizes or meet people of such calibre… We are not really in the business of meeting big people. We are just trying to create an impact with the work we are doing. But if it happens someone invites us for an award like this, we are really happy to take it,” he added. The award recognises young change-makers aged 18 to 29 from Commonwealth countries who are using their skills to transform lives in their communities. It is the first of its kind, and 60 young people were selected from 35 Commonwealth countries. 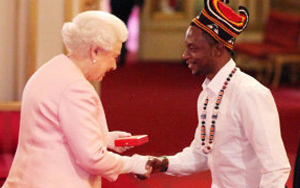 Just over a week ago, Nteff was the first of the 60 to walk up to Queen Elizabeth II and receive his award. He was wearing what he felt represented him most: a combination of traditional dress with a modern white shirt and black pants. He had been briefed on how to correctly address the Queen by Sir John Major, former Prime Minister of the UK: first you bow, then greet her as ‘Your Majesty’, and subsequently ‘Ma’am’. “I bowed, went up to her, and she said, ‘Congratulations, the work you are doing is amazing.’ I didn’t really know what to say. I was just like: ‘Yes ma’am, thank you ma’am’,” he reflected. In just 20 months Nteff’s GiftedMom has impacted over 3,000 women across Cameroon, increasing the rate of antenatal care attendance and baby vaccination by over 20%. In addition to sending SMS and voice notifications about maternal health, the social enterprise has also set up a helpline in the country. But Nteff has his eyes on reaching a much larger group. In fact, the goal is five million pregnant women and newborn mothers across the continent by 2018. He is particularly looking at Central Africa – countries such as Gabon and Central African Republic – as well as markets in East Africa where maternal and infant mortality is high. The social enterprise is looking to partner with various organisations within the HIV/Aids and maternal health education space. In addition to funding from various grants and awards, the service has also received sponsorship from companies wanting to send out information on maternal and infant products using the platform. And as the service expands across the continent, Nteff sees it also being used in case of health emergencies or awareness campaigns. For example, if an NGO is looking to spread information about polio vaccinations, but is struggling to get the message out, they can reach rural communities by using the GiftedMom service. The platform also offers mobile data collection solutions for organisations such as UNICEF who want to collect information in rural areas such as birth statistics. Alain Nteff is the winner of the 2014 The Anzisha Prize, a competition which recognises and celebrates young African entrepreneurs who are using entrepreneurship to solve problems in their communities.